My little kiddos were babies when the Nickelodeon show, Danny Phantom came out. Even though the show is now over, my kids have become huge fans thanks to the re-runs that they play on television. So when I had the opportunity to review the entire series, I knew my two munchkins would love it because they are big fans of the show. Watching a series from beginning to end is definitely different then just watching an episode here and there. We were able to watch a few episodes a day during their Winter Break and they loved it. This show was filled with lots of adventure, friendships and had lots of humor in it as well. The complete series is definitely worth getting into your collections, if not for your kids then maybe for a niece or nephew that are fans of the show. Danny Phantom the complete series is available for purchase starting tomorrow, Tuesday, January 28th. Feeling lucky?! Enter our giveaway below to win your very own copy of the entire series! Disclosure: All opinions are my own. 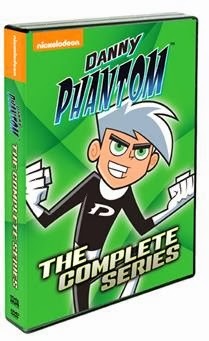 I received Danny Phantom The Complete Series at no cost for the purpose of this review.